Apex Legends is massive enough to rival any online game on the market, so of course it’s going to get significant new content and features. 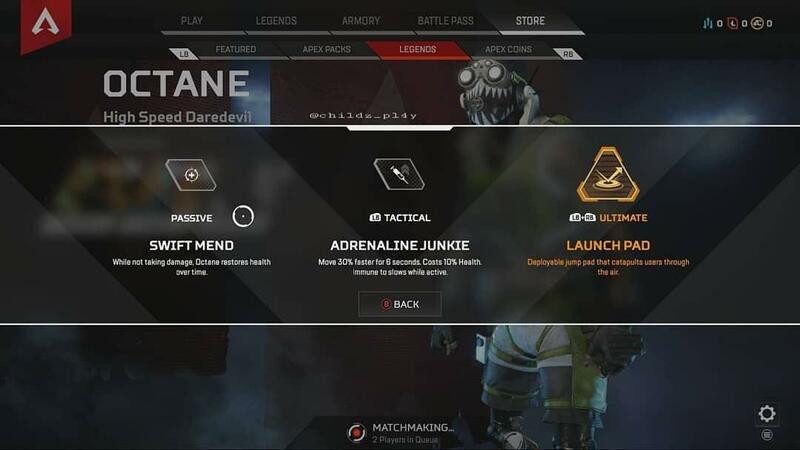 We’ve already seen leaks and datamines suggesting what to expect from new Legends, including one called Octane. A Reddit post seems to give more details, but this is one leak that no single grain of salt will cover. The image shows the Legends section of the game’s store, focused on Octane – the “high speed daredevil.” His listed passive is Swift Mend, which automatically restores health over time. His tactical is Adrenaline Junkie, which costs 10% health to give Octane eight seconds of boosted speed. And his ultimate is Launch Pad, which deploys an item that can launch you (and, presumably, other players) into the air. Octane’s apparent debut is on the Apex Legends subreddit with over 20,000 upvotes, though the image itself links is watermarked for ‘childz_pl4y’ – an Instagram account that’s since been set to private. A Reddit account pointing to that Instagram promised pictures and descriptions of Octane’s abilities nearly a week ago. In short, don’t believe everything you see on the internet. The name Octane itself has been pulled out of game files by multiple dataminers along with a ‘stim’ ability, and it’s likely that this particular image is just pulling together some educated guesses based on those more substantial leaks.